Digital marketing is the mainstay of so many brands these days. In an age when we can buy everything online – books, groceries, cosmetics, gifts, and clothes – our shopping has become increasingly digitized, and brands have realized that their marketing efforts need to be digitized, too. But what about luxury brands selling luxury wares that often account only for once-in-a-lifetime purchases? Wares such as fine jewelery, for instance. Can consumers be persuaded to purchase such personal and costly items online, and, if so, are social media and other digital marketing initiatives really the best way to go about it? 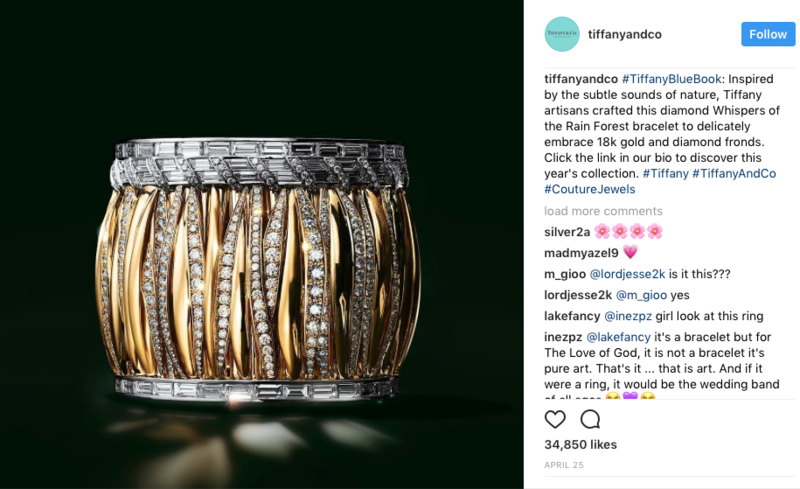 Premier jeweler Tiffany & Co. seems to think so, and it only takes a quick glance at the luxury retailer’s social media following to be convinced that the company must be right. With 7.1 million followers on Instagram, 9.4 million on Facebook, 1.58 million on Twitter, and 171,000 over on Pinterest, Tiffany & Co. is proving that there’s plenty of room for luxury on the world’s most popular social networks, and that no allure need be lost. Followers are just one dimension. When it comes to digital marketing – and indeed to Tiffany’s business model – it’s engagement that counts. But has Tiffany & Co. managed to retain its air of exclusivity and preserve its appeal to high-end customers at the same time as broadening its appeal so phenomenally across social media? The short answer is – yes. And in fact, what’s so remarkable about Tiffany’s digital marketing strategy is that the retailer has managed to wholeheartedly embrace social media yet still remain elite enough to keep its diamond reputation intact. With such a high-value reputation, it’s important that Tiffany finds a way to reinforce (and not tarnish) its brand on social media. And it does so brilliantly. Indeed, each piece of content that Tiffany & Co. publishes is as refined and as high-quality as any one of its products. Each image is as sophisticated as it is beautiful, and the accompanying copy often twinkling with poeticism. Here’s a recent example from the retailer’s Instagram account. This is a dignified social media campaign, one that is held strictly to only the highest standards – much like the luxury items that Tiffany and Co. sells. The retailer shares only what is truly wonderful and amazing. Note the comment a follower was inspired to leave in the above screenshot: “for The Love of God, it’s not a bracelet it’s pure art. That’s it… that is art.” The same could be said of the photography, and the carefully crafted words Tiffany’s digital marketing team chose to describe the piece. Tiffany & Co. is making engagement a top priority on more than social media. The retailer has designed a purchasing process to make the user experience as exciting and engaging as possible – most notably through its Engagement Ring Finder mobile app. In what might be considered an unusual step for a luxury jewelry-maker, Tiffany has decided that the engagement ring shopping experience needn’t be confined to a physical store. There can be no doubt that Tiffany’s digital marketing strategy is out-sparkling the luxury competition in terms of engaging its customers, particularly on social media. Indeed, Tiffany & Co. is one of the most-visible luxury brands online, and its strategy only serves to reinforce its reputation for quality, beauty and opulence, rather than tarnishing it as many luxury retailers fear may happen if they move towards the masses on social. 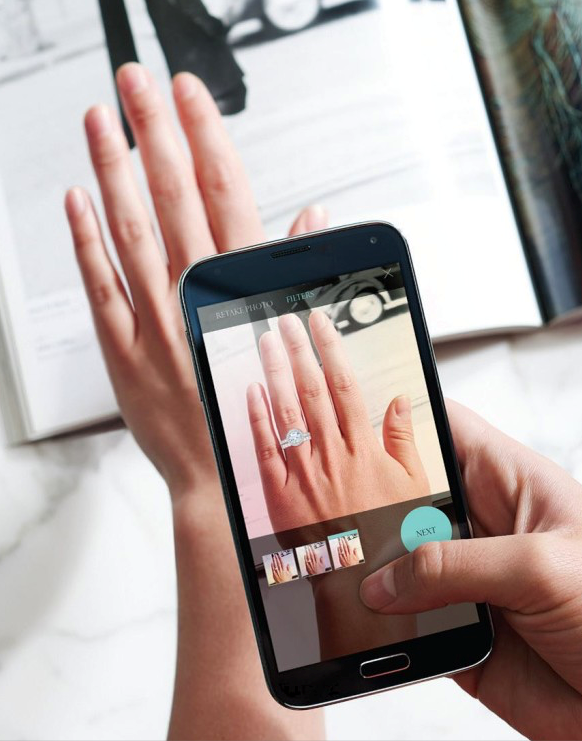 And combined with a mobile app strategy that brings the emotional excitement and experience of engagement ring shopping into the digital age, Tiffany & Co. has crafted a truly enticing online marketing strategy. The last word goes to Chris Ramey, president of Affluent Insights, as he praises Tiffany & Co. for its clear understanding of how the internet has revolutionized marketing, and the retailer’s willingness to embrace it.